Even with my electric sander it probably took me 3-4 hours of sanding. 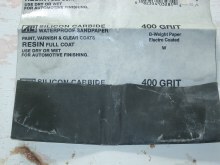 For the whole project I went through 15 220 grit, 15 120 grit, and 30 80 grit sanding discs ($24 worth). 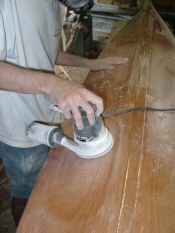 Sanding is not too much fun but worth it in the long run if you want a good looking finished product. The epoxy that overlies the fiberglass on the hull has to be sanded until it is a consistent cloudy white with no bright areas. 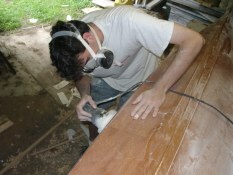 But you have to be careful you don't sand down to far and start cutting into the fiberglass. 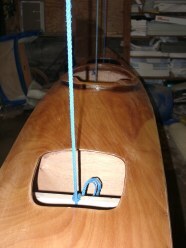 The epoxy covering the deck also has to be sanded until it is dull (not shiny) all over. In several places I sanded down to bare wood so I had to recoat those areas with epoxy and sand them more gently the next day. 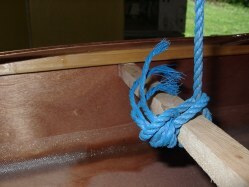 I found it was best to sand the joints either by hand or with fine sand paper so that you do not sand off too much. It is quite a good idea to wear a respirator at least for the sanding because epoxy dust is very irritating to your respiratory tract (or so the booklet said, I took their word for it). 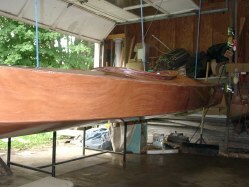 Hanging the boat up for varnishing worked great. I found it quite easy to varnish the bottom without even having to lie on my back. The sides and bottom actually ended up with nicer finishes than the deck because they were more protected from settling dust. 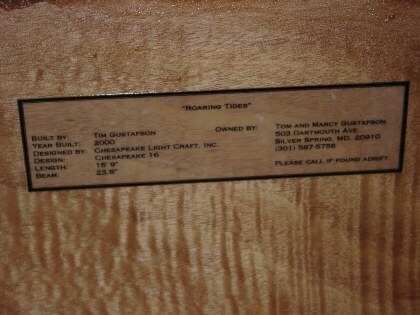 According to the can, it was dry "to the touch" in 2 hours and ready for recoating in 12. I didn't want to varnish at night because of bugs (nor get up at 4 AM) so I did a coat every 24 hours. 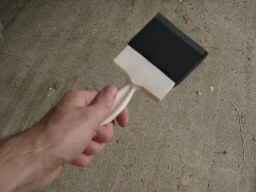 Then I cleaned it again with a paint thinner-wetted paper towel and it was ready for the second coat. 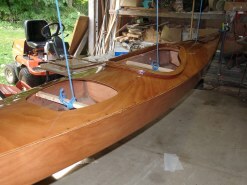 I did five coats in all, repeating the whole procedure of sanding, washing, varnishing with each coat. total page-views for the whole site.